I am older and never was very physical or coordinated, so must train myself in a set form to use every time. Otherwise missiles go everyplace!! I have been getting good results with a 1-3/4 (630deg) turn vertical spin-up. Today I added 1 more turn for 2-3/4 turns total. It was difficult, but when I could make it work, it seemed to add maybe 25% more distance. This is a significant improvement! Should I try 3-3/4 turns total? That's a lot of turns! It would be difficult retraining for me, and I'm concerned about reducing accuracy. I see/hear that some of you get good results with almost no turns & haven't a clue how you do it . Yurek, you're the distance champion! Please tell me what number of turns gives you maximum range without wasted motion? I´ve read here somewhere, that it´s not really the number of turns / wind ups that is the issue..
It´s probably more the speed.. I use several windups, not for speed up, but for gain concentration. When I have made up my mind I speed up the last turn and throw away the stone. That gives me a good feeling. I just make one pass, no wind ups. Whenever I try to "whirl " the sling, it seems centrifugal force is diminshed. One slow turn to get the stone going works best for me so far. I know lots of the better slingers don't use any wind-up (Like the guy in the Apache sling article), but I lose power without a preliminary spin. I start turning from the hanged position of the sling. For a good shot I must got a good tension of the cords just befor the final whip (strong and quick pull). Most often I use 1 or 2 initial turns (1+whip or 2+whip) for geting it. The 2 or more turns make the acceleration an easier (I mean a long sling), but the risk of geting unsuitable position of the pouch is a bigger too. You may also lose the timing easier in this case. When I use the "1+whip" way, I have a litlle time for the initial acceleration (to get the tension), so my forearm and wrist must work a more dynamically. I can't describe that movement, but I feel it like a two rythmical jerks. It has a simple rythm: one - two - and three (just the throw). I can throw without the initial turn(s) too. But when I am using a long sling, shots are less effective due to less the cord tension. I think too many turns make no sese. Usually the 1-2 is enough. If you use a short sling, you may try to throw without initial rotations, but a movement of your arm should be a more extensive, initially. The Apache's way is a good sample. IMHO it seems to be a matter of what feels right for the slinger. 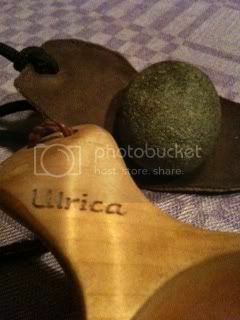 When warming up or playing with a new sling I use the same method that Ulrica described. After that it mostly depends on my mood (and other factors). 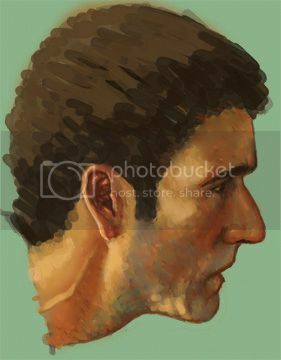 You are right, surely, one can use a lot turns for concentration and for choosing the best moment, or for other reasons, but it will be rather slow turns. The efficient acceleration usually follows just before the release. I think Mgreenfield has meant just that. Now that I think about it, when I'm playing with a shortened (or shorter) sling I don't use any spins at all. I bet there's another factor (relating to the ratio between arm length and sling lenth) to consider. For heavier projectiles, you need multiple rotations to bring it up to speed. For normal sized projectiles, I find that one rotation is the best. I find it much easier to release consistently (because there is less variation in a single loop). When ever I do several rotations, my rocks go everywhere. for me, the only reason for the windup is to make the sling taught before the final throw. Granted, heavier ammo will benefit more from the wind up than lighter ammo. Relying on spining the sling to generate velocity doesn't use it's full potential. What a sling does is double the length of your arm or more depending on the length of your sling. The sling pouch travels much faster around the pivot of your shoulder than your hand does when throwing because the sling has to travel a greater distance in the same amount of time (angular velocity). Simply spining the sling moves the pivot to your wrist instead of the shoulder getting rid of the advantage gained by adding the slings length to the length of your arm, at that point you might as well just throw the rock without it. What a sling does is double the length of your arm or more depending on the length of your sling. The sling pouch travels much faster around the pivot of your shoulder than your hand does when throwing because the sling has to travel a greater distance in the same amount of time (angular velocity). Simply spining the sling moves the pivot to your wrist instead of the shoulder getting rid of the advantage gained by adding the slings length to the length of your arm, at that point you might as well just throw the rock without it. Now THIS is interesting! I understand what nwmanitou is describing, but I dont have the shoulder flexibility to make the large arm motion with the "sling extension" that gives extra speed out at the "tip of the lever". Here the sling is an atlatl for rocks. My sling hand moves in a vertical circle in front of my body. Circle diameter is certainly less than 24inches, possibly as small as 18inches. Almost all rotation is in the ebow and wrist. With practice, I could probably hold my shoulder completely motionless, and still sling just fine. This now seems a very odd style compared to most. But it seems to work. I dont get Yurek-style distances, but I can still out-distance a lanky, athletic teen-ager's hand-throw by a factor of 2 or 3. Hmmmmm. Wonder what makes it work, and how I can improve it? What a sling does is double the length of your arm or more depending on the length of your sling. An excellent point! With this in mind, a better approach might be to keep your arm at full extension throughout the entire throw rather than bending at the elbow for more forward motion. I think there's more to it than that, though. I'm thinking about nunchucka. They gain power not from the extension of reach, in which case a stick would be a more powerful striking tool, but from the addition of an extra pivot point. As the wrist spins around the elbow's axis, the hand spins around the wrist's axis, and the striking half of the nunchucks spin around the axis created by the cord's attachment to the stick being held in the hand. This allows linear movement to be translated into circular movement. You can strike with a comparitively 'forward' arm motion and, depending on the angle of your wrist, allow the strike to come from different angles, with more speed and force than what your hand alone would carry, more than you would have if you were striking with a rigid stick. I think there may be some sort of interaction between the 'snapping' power of firing from the wrist and leverage gained by the fact that the sling is an extension of your arm. I wonder if it's a trade-off, more of one (straight-arm, long sling) meaning less of the other (ability to snap your wrist for more speed), or if they're cumulative?